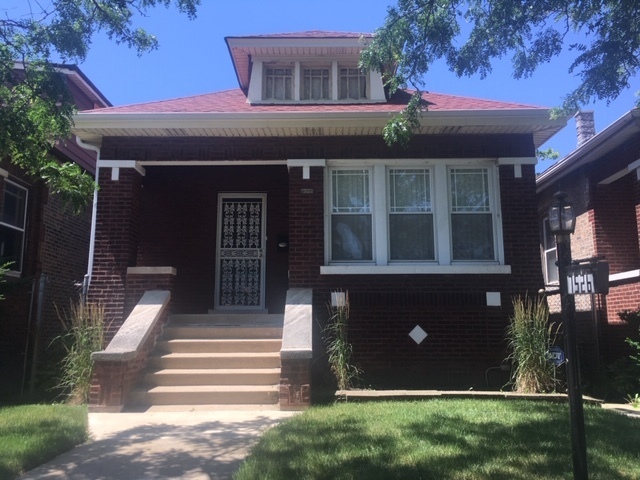 Chicago Bungalow tastefully renovated sits on tree-lined street w/beautiful curb appeal. Living room gorgeous dark stained hardwood flooring, pale gray walls w/white 2-inch baseboards in an open living room and separate dining room floor plan great for entertaining. Wall sconces add touch of elegance. Roman arch door creates a nice transition into the Chef's Kitchen that offers stainless steel appliances and glass-tile wall with White Shaker cabinets and granite counter. Kitchen pantry nice bonus. Enclosed rear porch for morning coffee or relax in the evening! Designer bathroom finishes match the finishes in the upgraded kitchen. Careful attention was given to the upgrades that this home offers. Basement ready for your final exquisite touch. Washer & dryer remains w/home...as is. This home is a must see....it will not last!